Laser hair removal utilizes a safe, laser light in a controlled area to administer pulses of heat to the hair follicles. The heat from the laser targets the follicles and destroys them, slowing and damaging their regrowth process. Our board-certified Physician Assistants use the Gentle YAG laser to remove hair from multiple areas, such as the legs, underarms, bikini area, back, face, and other popular areas that contain unwanted hair growth. Multiple treatment methods are recommended for optimal results, and each session typically takes 15 – 20 minutes to perform. 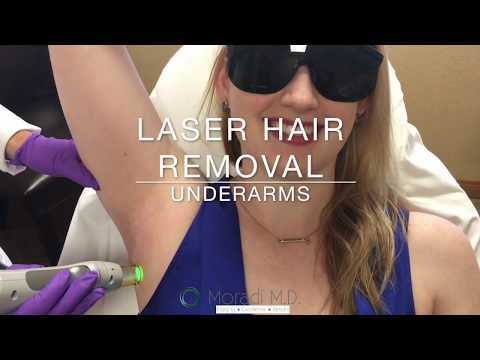 Call Moradi MD in San Diego, CA, to learn more about how laser hair removal can help you. During laser hair removal, it is common for multiple treatments to be done to ensure that the hair follicles are completely destroyed. At any given time, a certain number of hairs are in a resting phase, rather than a growth phase. Because the laser treatment is not effective on the hair follicles that are not actively growing, multiple sessions are needed. On average, it takes about 3 to 5 treatments to permanently disable new hair growth. These sessions are spaced between 3 or 4 weeks to make sure the area has already recovered from the previous session. During the procedure, the laser can precisely target the hair follicle roots. When this happens, the follicle absorbs the heat and ultimately falls off and stops regrowing. "I moved to San Diego 9 years ago and with the beautiful weather I decided to look into laser hair removal. I responded to an ad and found a little spa tucked away in La Jolla. Dr. Moradi office is now located in Vista and I must say 9 years later I still keep coming back for all All-Type Office Services, WHY? Well! When it comes to my face the one and only word I can think of is TRUST! Dr. Moradi and his staff are by FAR the best. The staff is friendly, courteous, and professional and makes you feel comfortable as soon as you walk through the door. Dr. M, assistant Veronica is one of the nicest sweetest people you could ever meet!The office is modern, very clean, and the environment feels more like a spa than a physician's office.If you are looking for a new Esthetician! Magda is the person to see.AWESOME, is one word that describes how you will feel after any treatment or session with Magda. I have already recommended Face Beautiful to several friends and co-workers, who are now loyal customers." "I have been going to Dr. Moradi for several years now for Botox I love Dr. Moradi and Veronica. Dr. Moradi does a great job with Botox and Filler. I have had many people try and talk me into filler and I finally let Dr. Moradi do some at his recommendation last year and have been extremely happy with the natural looking results. I love Magdalina, and I love going to her for facial, peels, epi-pen, and microdermabrasion she does an amazing job. I especially like the epi-pen, and the results from her treatments and product recommendations have made a huge impact on my skin. When I tell people my age(58) they are surprised, I must give credit to Dr. Moradi and Magdalena for making me look younger. Jessica is also at Dr. Moradi's office and she is a sweetheart she does IPL, dot laser and laser hair removal. She does a great job and I have been very happy with the results of my treatments with her. I have never felt pressured to do anything. I believe that Dr. Moradi is very cautious and meticulous about his work, and I trust his skill and opinion. Everyone at Dr. Moradi's office are friendly and professional. I look forward to my appointments and am thrilled with the results of all the treatments I have had done. I am so glad my friend recommended Dr. Moradi to me. Sincerely, Tonya"
"I moved to San Diego 9 years ago and with the beautiful weather I decided to look into laser hair removal. I responded to an ad and found a little spa tucked away in La Jolla. Dr. Moradi office is now located in Vista and I must say 9 years later I still keep coming back for all All-Type Office Services, WHY? Well! When it comes to my face the one and only word I can think of is TRUST! Dr. Moradi and his staff are by FAR the best. The staff is friendly, courteous, and professional and makes you feel comfortable as soon as you walk through the door. Dr. M, assistant Veronica is one of the nicest sweetest people you could ever meet! The office is modern, very clean, and the environment feels more like a spa than a physician's office. If you are looking for a new Esthetician! Magda is the person to see. AWESOME, is one word that describes how you will feel after any treatment or session with Magda. I have already recommended Face Beautiful to several friends and co-workers, who are now loyal customers." "I can't say enough great things about the girls at Moradi MD and Dr. Moradi. I get laser hair removal with Becca and she is so sweet and takes great care of me. She told me that she was so excited that I was coming in today which made me feel very special, so thank you :) I get my facials with Ricky and she is just the sweetest. She is so knowledgeable about skin care and she gives the best facials, my skin always feels radiant and fresh when I leave here. My mom came in to get botox with Dr. Moradi and after her consultation he told her that she didn't need it. She was relieved and she was so grateful that he was looking out for her and her best interest, he didn't just take her money like other plastic surgeons would. So kudos to him! If you're looking for a place to get pampered and feel great about yourself do YOURSELF a favor and come here. You won't regret it, they're worth every penny!" Patients will feel a slight sting on the area that is being treated. The laser beam can slightly sting, but a cold ice pack can be applied between pulses to help with the patient’s discomfort. Sessions may last from 15 minutes up to an hour for larger areas, such as the back. Although patients can resume normal activity after treatment, the treated area will look and feel similar to a sunburn. Patients should avoid exercise for about 24 hours to allow the skin to calm, and sun exposure should be avoided during treatment. Individuals with light skin and dark hair generally are the best candidates for laser hair removal. That being said, individuals with varying skin tones and hair color can also be considered for this treatment, but in order for the laser to “find” the hair and effectively treat it, it has be able to “see” it. Therefore, those with light skin and very light blonde hair may not be the best candidates for this procedure. If you're struggling with constant shaving and painful waxing, then consider an alternative to these methods. Schedule a consult at our San Diego office to learn more about laser hair removal and booking an appointment.